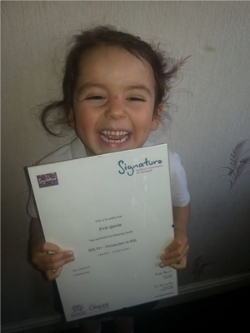 We are delighted to tell you about a very special five year old girl, Evie Gavin, who recently passed the first unit of the Signature Level 1 Award in British Sign Language. Evie's mum Ayesha, who is Deaf and runs Ayesha Communications in Lancashire, has been signing with her since birth and she produced her first sign, milk, when she was only ten weeks old. Ayesha is also teaching her 17 month old son to sign. Ayesha told us, "We are immensely proud of Evie who worked hard towards the 101 qualification. She was delighted to receive her certificate and has been teaching her class mates a few signs as well". Evie was bursting with excitement when her head teacher presented her with her Signature BSL certificate at a special Friday Shooting Stars Assembly at school. Signature chief executive, Jim Edwards, said "It's encouraging to see someone as young as Evie embracing British Sign Language, having fun and committing to her learning". Evie plans to continue her studies to complete the Level One qualification and beyond.